The urgency over trying to ensure that such a slaughter “never happens again” – it fades. The calls for new legislation, reasonable restrictions which might make it just a little bit more difficult to kill as many people as fast as possible, grow stale and over time start to seem impractical and implausible. And so conventional wisdom congeals more or less where it was before the massacre. And guess what? That was the obstruction strategy all along – a smart but cynical bet on civic amnesia, pushed by lobbyists who cajoled congressmen and advised them to resist the wishes of 90% of the American people. Reality Check: 90% of Americans rarely agree on anything. We’re diverse that way. But earlier this year, the respected Quinnipiac poll found that 91% of Americans supported universal background checks for commercial firearm purchases – including 88% of gun-owning families. Hell, a poll commissioned by Mayors Against Illegal Guns conducted by conservative pollster Frank Luntz found that 74% of NRA members supported background checks on every gun sale. But when a bipartisan bill to achieve that end came up in congress, it couldn’t get enough votes to pass. Got that? 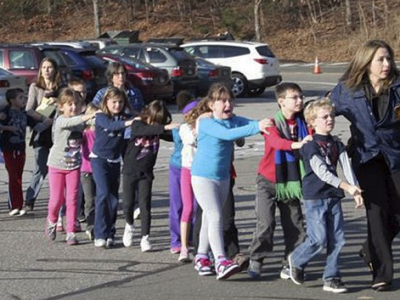 Poisonous polarization doomed even a modest bipartisan attempt to take action after the Sandy Hook slaughter. More ambitious proposals – such as reinstating the assault weapons ban which had been in place for a decade before, or banning the sale of high capacity ammunition clips – were declared dead on arrival in Washington DC. There was outrage initially, calls to kick the 41 Republicans and 5 Democratic Senators who blocked the measure out of office. The gun advocates are tireless and they bet on suburban swing voters forgetting about their anger. In the meantime, gun advocates set about targeting state legislators who voted for new gun laws. In Colorado, the site of 2012’s mass shooting at a midnight showing of ‘Batman’, two Democratic State Senators lost their seats in a recall election that drew massive outside spending, including from New York City Mayor Michael Bloomberg. The result of the low-turnout election was read as a decisive defeat in Washington DC, and soon the message spread that gun laws were too politically risky to pursue. Much pearl-clutching ensued. Guns are part of our culture in the United States, a legacy of the frontier culture that emphasized the need for individual self-defense. I know that’s hard to appreciate from across the pond. But here’s what’s undeniably ugly: we see the death toll from a Newtown shooting every week, just spread out among different jurisdictions. There are 11,000 Americans killed by gun violence every year, excluding suicides. And since the Sandy Hook slaughter, there have been at least 16 mass shootings in the USA – from whole families gunned down to 5 people killed in an attack on a community college in Santa Monica to 12 people murdered at the Washington Navy Yard in September. And upon hearing of each mass murder the familiar receptors kick in, feelings of outrage intermingled with déjà vu. This entry was posted in Columns, Featured Columns and tagged National Security, The Telegraph. Bookmark the permalink.